Montana's governor calls on Idaho to ban game farms Poll shows Oregonians now regret passing their state’s "property rights initiative"
The post on the lack of cougars resulting in damage to the ecology of Zion National Park has prompted a lot of comments. 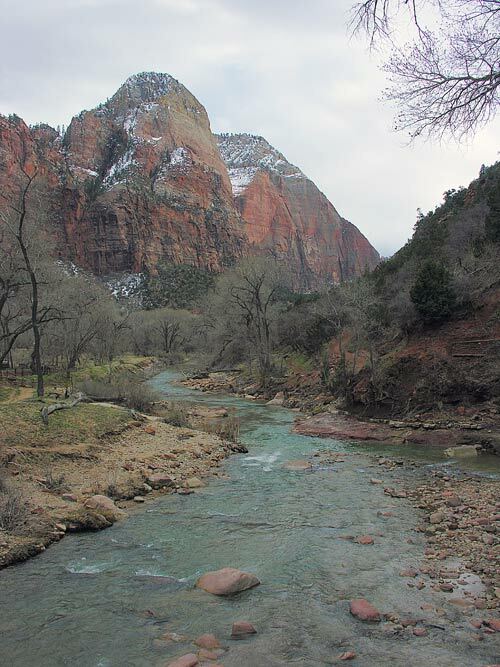 I thought I’d post a photo I took of the Virgin River in Zion Canyon last March. The streambanks are trampled and bare or are calving off where the silt is deep. Some of the erosion is human, but the deer follow the human trails and vice versa. Those high scenic photos you see of the Virgin are taken up in “The Narrows” where the walls close, leaving little riparian zone.